Happy Friday everyone. 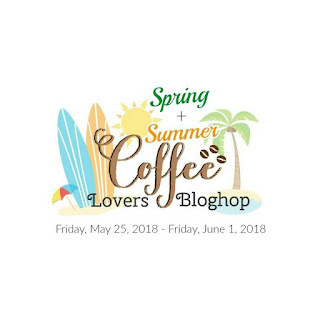 We're excited to be a Super Sponsor for the 2018 Spring and Summer Coffee Lovers Bloghop. If you'd like to participate, you'll find all the information to join the fun at Coffee Loving Card Makers blog. Don't miss out on the fun! There are lots of great prizes to win. If you're new to doodlebugsWA.com, welcome. We're so glad you stopped by! We hope you enjoy our blog and online store. If you've been here before, welcome back! To thank you all for stopping by, we're offering everyone a 20% discount on any purchase made during the hop. 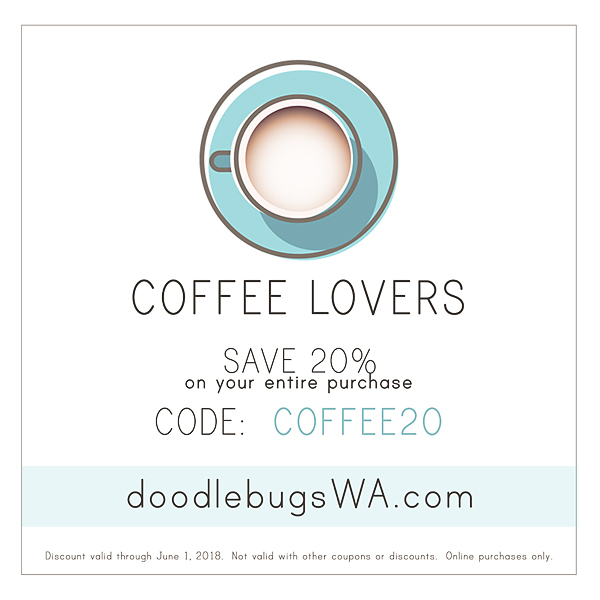 Enter code COFFEE20 at checkout. Remember, all orders over $20 receive FREE shipping! Of course, we can't pass up the fun. 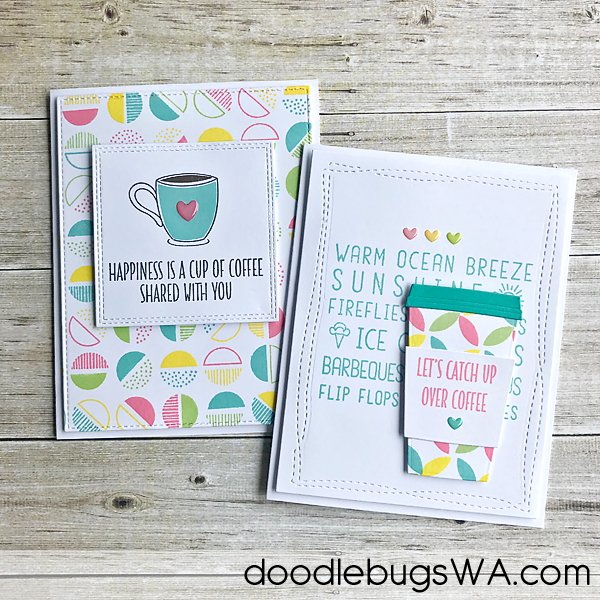 So, we've created two coffee themed cards using some fun, summer colors. We hope you enjoy them and that they inspire you to get creative today. We used the new Retro Petals Turnabout stamp from Concord & 9th to create this fun pattern in bright, summer colors. We then used the Coffee Cup die from MFT Stamps to create the cup from the fun pattern we created. For the second card we used another favorite from Concord & 9th, the Semicircle Turnabout Stamp. 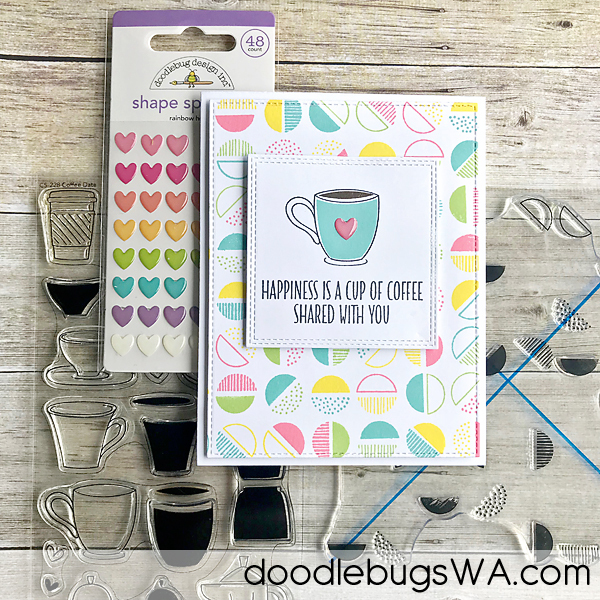 (We love these stamps and their ability to create fun patterns in colors of our choice) The coffee mug was stamped using the Coffee Date stamp set from MFT Stamps. oh my, I'm loving your cards...those colors! Thanks so much for being a Super Sponsor! Thank you so much for sharing. I love how spring like these samples are. Happy Crafting! Love all of these they are so bright and cheery.thanks for being a super sponsor. Love the happy colours on your cards! Thanks for being a sponsor. Simply beautiful! I love the pretty spring colors and the clean designs to your cards! Definitely love the bright, cheerful colors. So cool and love the graphic designs! Thanks for being a super sponsor! super cute cards! I always love your cards and ideas! TFS and for the chance to win! So cute! I love the happy colors! those cards are super adorable! 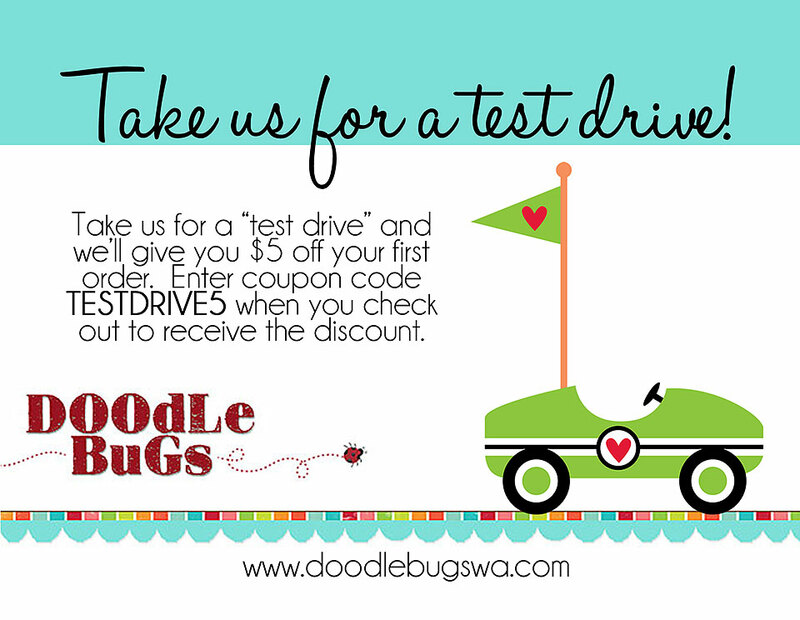 You've just GOT to love Doodlebug! Thanks for sponsoring, and have a blessed week! So lovely with all the fun colors. Thanks for being a sponsor too. These coffee cards are so much fun! I love the cheerful summer colors against the crisp white! They all look amazing! Thanks for being a super sponsor too! Cute cards. Thanks for being a super sponsor. They are absolutely fabulous and great! These are beautiful... love the colors and great patterns you've created! Thanks so much for being a Super Sponsor and for the sale! Beautiful cards. I love the images and the fun summery colors. So pretty. Thanks for sponsoring the Coffee Lovers blog hop. 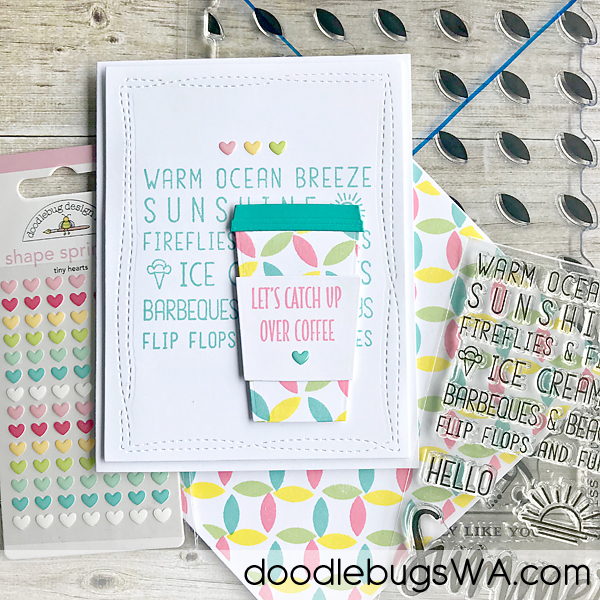 Lovely cards with a real summer-look. 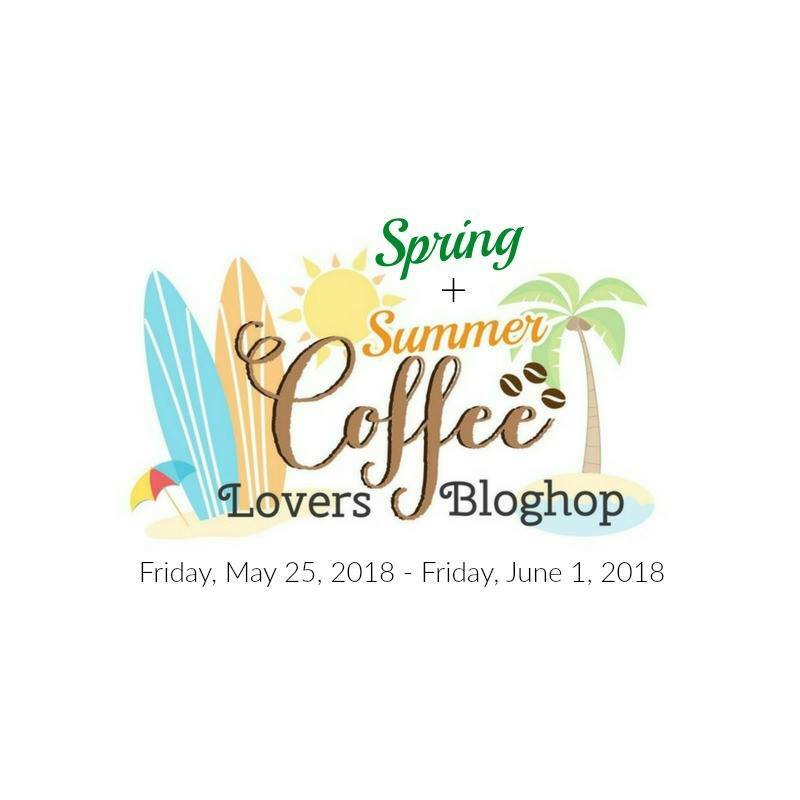 Thank you for being a sponsor toooo on this Coffee lovers blog hop. Love both of your coffee cards! The pastel colors are awesome! Thanks for being a Super Sponsor for the Spring & Summer Coffee Lovers Bloghop! Oh my gosh I love your cards! The colors are so fun! Fabulous projects! Thanks for being a sponsor to this event! Adore the awesome colors! WOW. Thanks for being a super sponsor! Beautiful bright colors on your cards! Thanks for being a sponsor! Awww!!! Beautiful cards! Love the bright colors!!! Such beautiful springtime colors and I love the adorable little enamel hearts!!! Thank you for being a super sponsor! so cute and fun with a great message. Thank you for super sponsoring. Such pretty cards! I really like all the pastel colors going on with each card! And the cute little pastel hearts added to them just so perfect! Also thank you so much for being a great sponsor too! Fab colour palettes on these gorgeous cards. Cute card designs and colors. Thanks for being a super sponsor. These are so great cards ! Thank you for being a great sponsor and sharing these wonderful and inspirational samples. They are so colorful.